Today, UPMC is a $10 billion global health enterprise with vast property holdings and hundreds of millions of dollars in annual profits, and many believe that as UPMC has become richer and richer, it has turned away from its mission and the responsibilities that comes with its charity status. 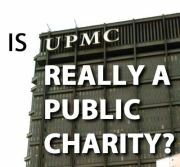 Instead of putting charitable care at the center of its work, UPMC spends less than 2 percent of its annual revenues on free healthcare while hoarding $4 billion in reserve.. It closes hospitals in underserved areas with poor health outcomes to open them in communities that already have a hospital – just the hospital of a competitor. UPMC’s CEO is paid more than $6 million a year and 22 other UPMC execs make at least a million a year, but UPMC workers are the third highest users of Medicaid in our state, just after Walmart and McDonalds, according to the Pennsylvania Department of Welfare. And rather than seeking ways to open its doors to the community, UPMC is threatening to stop treating over 3 million Highmark subscribers. Further, the National Labor Relations board last month charged UPMC with more than 80 violations of the rights of its employees. Those are not charitable acts and they are not our values. We believe in a strong middle class, access to affordable healthcare, and everyone pitching in to create quality public services like schools, roads and buses – and we believe that UPMC should start acting like a purely public charity. Section VIII § 2 of the Pennsylvania Constitution requires “purely public charities” to donate substantial portions of their services to people in need, to reduce the taxpayer burden with its services, and to operate without a profit motive in order to qualify for tax exemptions.